A native of Northern California, George Benton England resides in New York City where he performs and teaches classical and modern guitar. His concerts span several style periods and highlight rare works as well as established favorites. 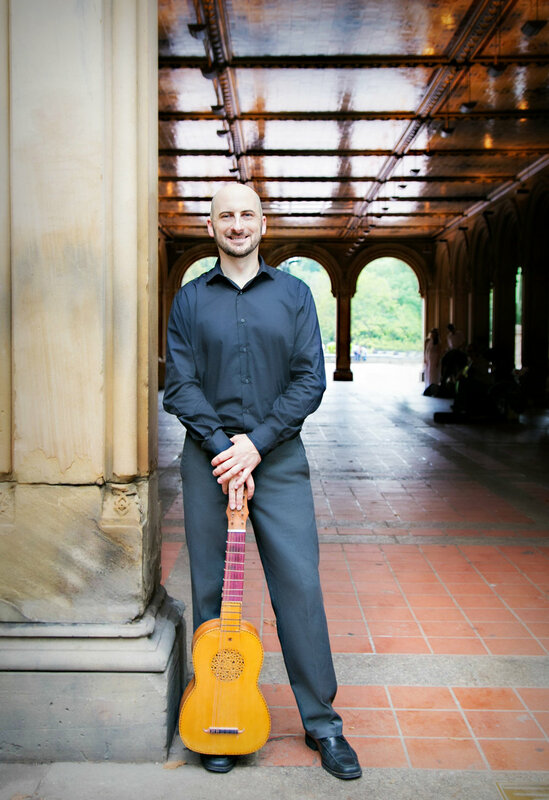 He is regularly engaged as an ensemble player, most recently with the New York-based Ensemble Musica Humana, on vihuela and lute; on baroque guitar and theorbo with Sinfonia Spirituosa; and with soprano, Dr. Kathleen O'Rourke, in Duo Raccontare. While Dr. England performs music from the Medieval through Modern eras, his teaching is continually renewed and draws from multiple approaches. Dr. England has lectured at California State University Northridge, Yuba Community College in California, and instructs guitar throughout New York City and Long Island. He holds a Doctor of Musical Arts degree from Stony Brook University, and a Master’s and Bachelor of Music from California State University, Sacramento and Northridge, respectively. He has studied with Jerry Willard, Richard Savino, Steven Thachuk, and Ronald Purcell. Nacido en el norte de California, George Benton England reside en la ciudad de Nueva York, donde interpreta y enseña guitarra clásica y moderna. Sus conciertos abarcan varios períodos de estilo y resaltan obras raras, así como los favoritos establecidos. Participa regularmente como musico de conjunto, más recientemente con el Ensemble Musica Humana con sede en Nueva York, en vihuela y lauda; en guitarra barroca y teorbo con Sinfonia Spirituosa; y con la soprano, la Dra. Kathleen O'Rourke, en Duo Raccontare. Mientras que el Dr. England interpreta música desde la Medival hasta la Musica Moderna, su enseñanza se renueva continuamente y se basa en múltiples enfoques. El Dr. England ha dado conferencias en la Universidad Estatal de California en Northridge, Yuba Community College en California, e imparte clases de guitarra en toda la ciudad de Nueva York y Long Island. Tiene un doctorado en artes musicales, de la Universidad de Stony Brook, y una maestría y licenciatura en música de la Universidad del Estado de California, Sacramento y Northridge, respectivamente. Ha estudiado con Jerry Willard, Richard Savino, Steven Thachuk y Ronald Purcell.